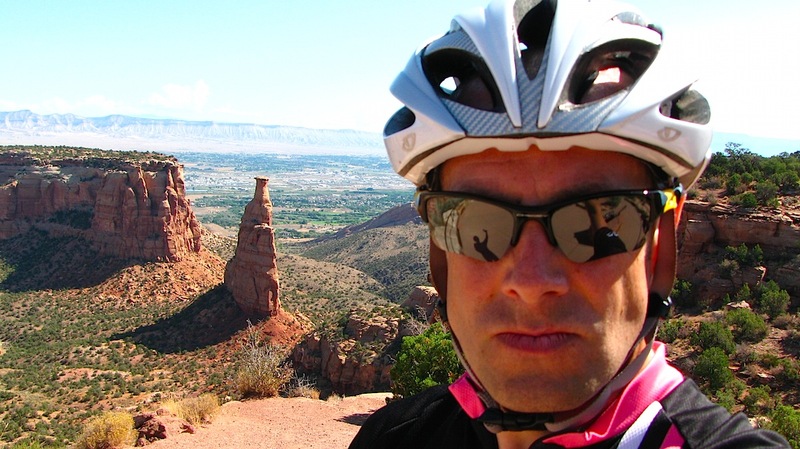 You are currently browsing the Fat Cyclist weblog archives for September, 2009. You’d think, after 43+ years, I’d know myself pretty well. But there’s something new about me that I’ve been exploring for the past couple weeks. No, wait, that’s not it. Actually, this new thing about myself is intensity. I honestly never knew I had any in me. I considered myself 100% relaxed. 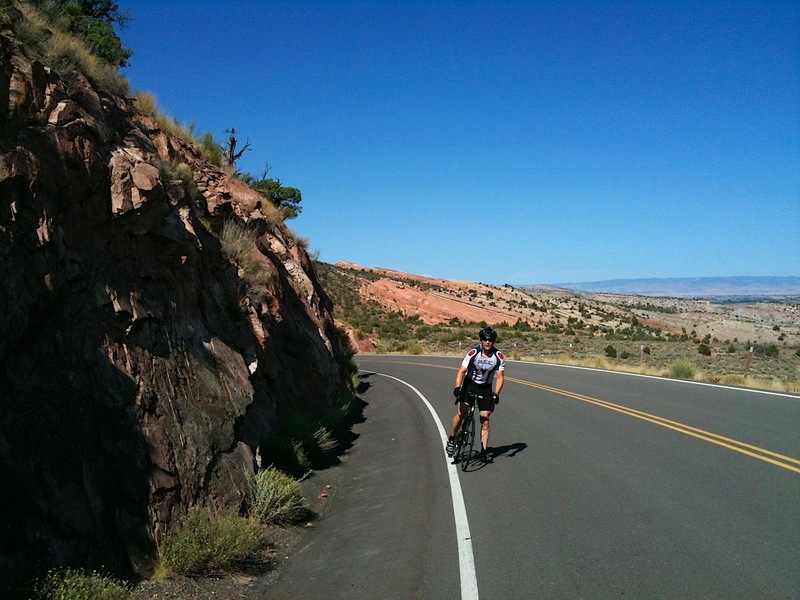 But lately, I have found I love to ride climbing intervals. And I love to time trial. And I love to drive a knitting needle up my nose using a ball peen hammer. Hold on, strike that last one. I’m not sure how it got in there. My point is that I have found that for some reason, lately I don’t just put up with the physical pain and mental blackness that come with a maximum effort. I’ve been seeking it out. Does this all seem a little creepy? OK, can we pretend it doesn’t for a bit, then? For example, a week or so ago, I decided to Time Trial the American Fork side of the Alpine Loop. 10.5 miles, around 3000 feet of climbing. I did it in 53:11. Earlier this year, Mark, Sam and I killed ourselves doing this ride in about 58 minutes. And then yesterday, I — for the first time ever — Time Trialed the Clark’s MTB climb in Corner Canyon. Now, this is a popular local TT course, with honor-system-based annual standings posted and everything. Meanwhile, my mouth isn’t just hanging open. It’s stretched open. But my eyes are squinting and my ears are back, so I picture myself as grinning madly. My mouth is nothing but a giant oxygen intake device, and it is staying open. If drool needs to leak out, fine. If sweat and snot need to drip in, well, it all started in the same place anyway, right? Fortunately for everyone in the whole world, I did not encounter a single person going up or down the trail during my TT. I reached the top, punched the red button on my Garmin, felt the first wave of nausea hit, and then looked at the time. I finished in 9:50, which triggers an overlay of elation on the nausea. Peculiar. That 9:50 is good for the #3 spot (out of 55 recorded) in the 2009 results, and the #6 spot in the all-time results. Which means the weird has happened: I have gotten lean (154 pounds today) and fast. I believe it’s time to put this to the test. 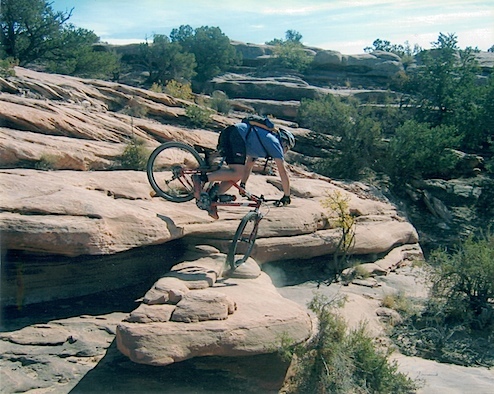 Brad, Kenny, Rick Sunderlage (not his real name) and I will be Team Fatty at the 24 Hours of Moab this October 10 – 11. We will be racing in the Rigid Singlespeed class. When you consider that Kenny and Brad owned the singlespeed division of the Park City Point 2 Point and when you further consider that whenever Rick Sunderlage and I go riding he just spins away from me, and when you finally consider that I seem to have crossed some sort of threshold, you might reasonably assume that our prospects for this division in this race are pretty good. More important than that, though, is what I consider genuinely cool about my team: we’re all part of the Core Team. I’ll be racing with three of the best friends I’ve ever had. And that is extra motivation, right there. Motivation to kick their butts, that is. You know what? It just occurred to me that not everyone in the world knows what a 24-Hour race is. Well, it’s pretty simple. 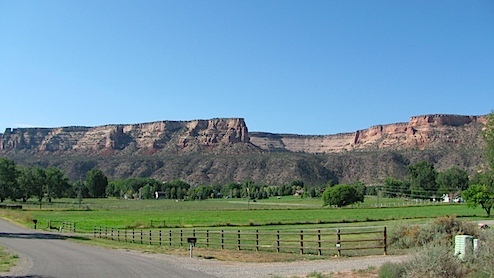 The course is set up to be a circuit — in this case, around twelve miles long. One person from the team races at a time, handing the team baton (a small wooden dowel) to the next teammate after completing a lap. So you ride hard for an hour and change, hand off to the next guy, and then have a few hours to eat and relax until it’s your turn again. And you, as a team, try to rack up as many laps during a 24-hour period as you can. It’s a very stupid idea, and I’m excited to do it. Here’s my problem: I do not have any good bike lights for racing. And I am going to need really, really good bike lights so that I can see and avoid all the stuff that I will otherwise crash into. It is my fervent hope that someone out there is a honcho or knows a honcho at one of the bike light manufacturers or PR firms and has the insanely good idea that it would really be a great idea to outfit Team Fatty — one of the top two cycling blogs in America! (and I’m pretty sure Bike Snob NYC isn’t fielding a team) — with lights. If you are, you should email me. I daresay you’ll get a quick response. UPDATE: Big thanks to Princeton Tec, which has stepped forward and outfitted Team Fatty with a full complement of their most powerful light setup: The SwitchBack 3. With a 6-hour burn time at high-beam, we won’t even have to worry about recharging. Count on our impressions of these lights after — and probably during — the race. Also, if you’re a bratwurst maker, you might want to get ahold of us. Or if you’re Gulden’s Mustard. I would love to be sponsored by a reputable Bratwurst maker and Gulden’s Mustard. “Team Fatty, Presented by Twin Six, Powered by [your name here] Bratwurst” has a very nice ring to it. OK, all done whoring now. 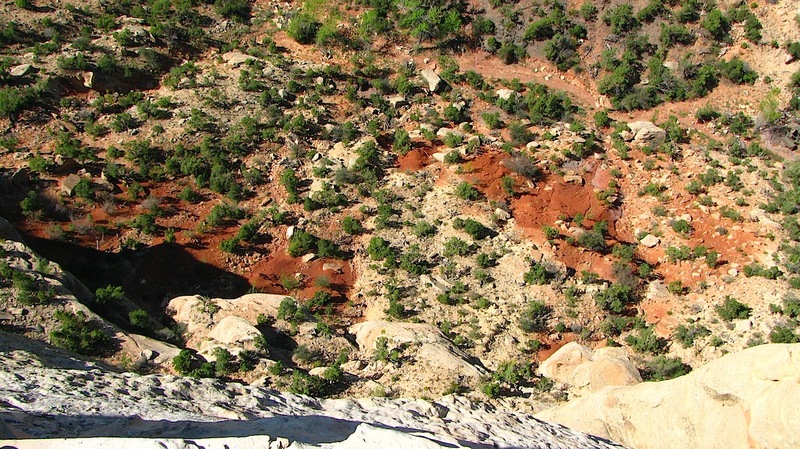 I’ve heard that there’s WiFi access at the 24 Hours of Moab. If that’s the case, then I will — when not racing or eating or doing something else — post updates on the race. I suspect that these updates will become increasingly incoherent and angry as the race progresses. We were just riding along. Mark was introducing me to a terrific MTB trail network — Millcreek Canyon — and we were really, honestly, and truly just riding along. And then the god of mountain bikes looked down on Mark and — for whatever reason — was not pleased. So Betty (the god of mountain bikes is a woman named Betty, and I understand she’s super hot) smote Mark. Just knocked him clean off his bike. No warning or anything. Just tugged his front wheel out from under him and pushed him over. Unfortunately — for both Mark and me — I was right on Mark’s tail. I no sooner saw the hand of Betty show him who’s boss (hint: it’s Betty) than I crashed into the wreckage formerly known as Mark and his bike. So startled was I by this chain of events that my mouth hung slack. This worked out badly for Mark, because my open mouth was bound to collide with something. In this case, my front teeth would collide with his knee, drawing blood. For those who are curious about my first impressions of this unintentional foray into cannibalism: tastes like chicken. Disappointing, really. Oh, and speaking of knees — because, two paragraphs up, I really was briefly speaking of knees — my knee was what took first impact on the hard-surfaced, gravelly trail. For those wondering, the green socks are my wool Ibis socks. I’m a fan. I really hope that leaves a scar. But you know what’s really weird? The fact that I’m this far into today’s post and haven’t even broached today’s topic. Specifically, after all the fun and games are over, someone’s going to have to clean up this mess. 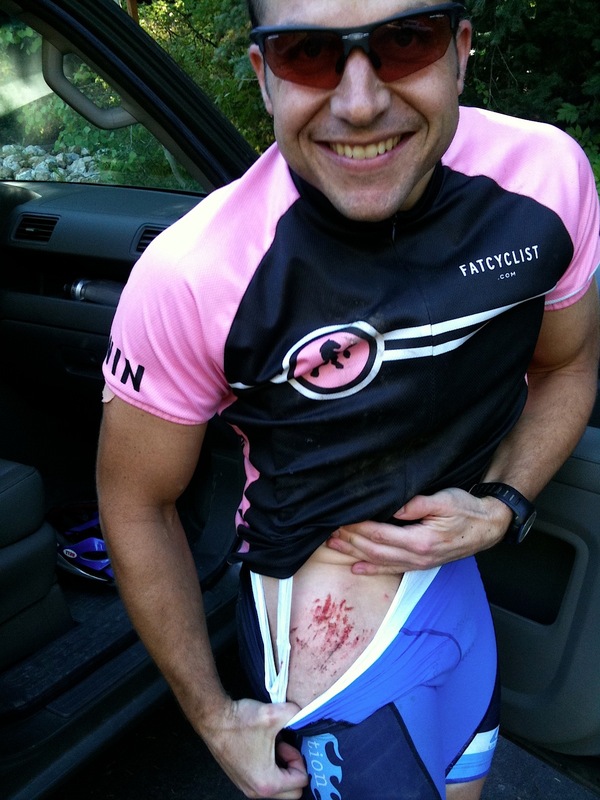 A good hard bike wreck — road or mountain — hurts really bad twice. The first time is when you incur the injury. And the second is, of course, is when you wash it. Because the washing is so much more than soap-lather-rinse. In fact, it’s even more than soap-lather-rinse-repeat. It’s a ritual of pain. An assertion that you are willing to suffer for your art, such as it is. And above all, it’s an absolute lock of a way to ruin a white washcloth. I expect there are some people who, when they’ve got a bike injury to clean up, step into the shower — tub, whatever — and get straight to it. Instead, I wash everything else first, slowly and carefully. I wash my face extra-well, because — who knows? — perhaps I’ll otherwise break out with my first acne in twenty years. I wash between my toes. I wash my back, without the aid of a back scrubber. Takes more time that way, especially if you’re being thorough. I wash my hands, which I generally otherwise don’t do in the shower, figuring they see plenty of soap and scrubbing action without having to be specifically attended to. Which is unfair, when you think about it. Perhaps I might even put shampoo on my head, which is a cruel mockery of both my head and the shampoo upon it. Then maybe I’ll squeegee the glass and clean the shower’s grout. And then cast about, desperate for something — anything — else to clean besides the wound. At some point, though, the wound must be cleaned. When it’s time to start the process of cleaning the wound up, I tell myself that my wound is just a surface that needs to be cleaned. It is not part of me. Any pain I experience has nothing to do with the actions I am taking, and so I will not stop just because I am in pain. This doesn’t help at all, by the way. I have no idea why I say it to myself. I then take the two very simple tools I use for cleanup — Dial soap and a dark-colored washcloth — and begin to lightly daub at the wound, hoping that perhaps all the blood and dirt and scabs will just fall off, due to the overwhelmingly strong combined forces of gravity and soap. Then I begin the scrubbing ramp-up. Each stroke just a little bit more forceful than the last, until the wound has been successfully opened up again and is bleeding freely again and oh no I think I perhaps need a transfusion because I suddenly am having a difficult time standing and the room is spinning around. Oh, and also I should mention that I usually make pitiful mewling noises while I do that part. With all the general stuff washed off, the easy part — and by “easy” I mean “bearably painful” — is over. Now it’s time to get to the stubborn stuff. The stubborn stuff tends to take the form of very small rocks, or stubborn dirt. Or a riding buddy’s front tooth, I suppose. And it’s usually hidden beneath a flap of skin that didn’t get torn all the way off, so now it’s acting as a tupperwarish lid, keeping the dirt and grime safely sealed away inside you. Yep, that voice really says everything in all-caps like that. And don’t think I haven’t told it how annoying that can be. So I do my best to ignore the voice and remove the skin that isn’t doing me any good anymore, so I can get to the dirt and rocks and dog hair and pieces of asphalt that are trying — and making a pretty good show of it — to bond with me. Eventually, the wound is clean. And then comes the rinsing. Which, magically, seems to hurt just as bad as everything else that has come before. Or maybe worse. By then my gauge of pain is a little bit fouled up. Once cleaned, I apply an entire tube of Neosporin, because I work under the theory that Neosporin’s main job is to prevent any air molecules from getting near my blood. My science may be shaky here. And then, once the ointment (really, is there an uglier word in the English language?) is applied, I like to discover that the only kind of bandages I have left in the house are the tiny little ones that don’t quite make it all the way around your pinky finger. Good thing each box of bandaids comes with around 80 or 90 of this size. With patience, I can make a sort of quilt from these tiny bandaids and apply them to my wound. This will, naturally, not adhere to any place on my skin where there’s any Neosporin at all. Though it will adhere very well to my open wound, and will in fact bond chemically with it in seconds. I swear, sometimes all this post-crash cleanup takes so much time and effort I wonder why I bother injuring myself at all. A Note About 2010 Jerseys from Fatty: Twin Six and I have started getting a lot of email from people asking about why their 2010 Fat Cyclist jerseys haven’t arrived. As mentioned in my pre-order post, your stuff will arrive in mid-November. Also, I’ve been getting a lot of email from people wondering how they can buy 2010 jerseys now. Well, right now you can’t order a Fat Cyclist jersey. However, once the pre-order shipment comes in and everything’s been shipped out and had time for exchanges and returns, there will be some jerseys left over, at which point they’ll go up for sale. I’ll announce at least 24 hours ahead of time when they’re available. Please note that these “leftovers” jerseys always go fast. If you want one, you shouldn’t wait a day or two to think about it, because by then they’ll be gone. 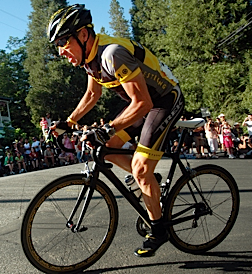 Win a Jersey Signed Both by Lance Armstrong and…Me. OK, I’ve given everyone a few weeks off of the whole “Help Team Fatty Fight Cancer” thing. I figured you all deserved a break. And frankly, I felt like I deserved one too. But now we’re just a month or so away from the final LiveStrong Challenge event, and it’s time to kick it into high gear. 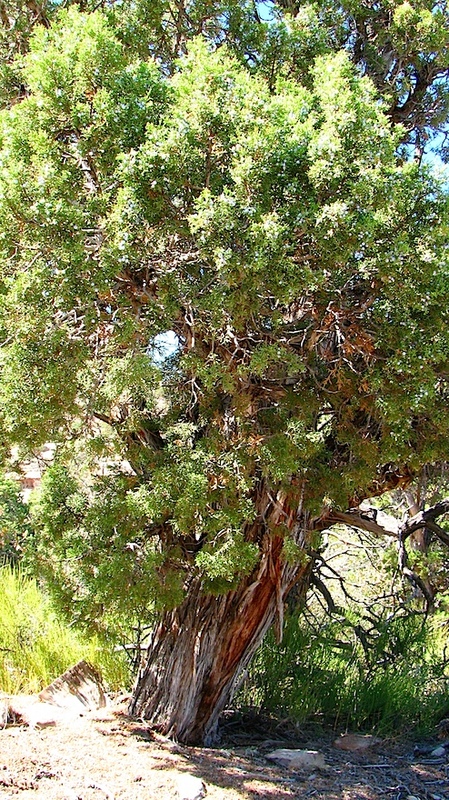 Over the next few weeks, you’re going to see some pretty remarkable fundraising contests. And we’re going to start with one engineered by my friend BikeCopVT, a frequent commenter and one-time guest poster at Fat Cyclist. Ben participated in the LiveStrong Philly event and as part of his schwag bag from LAF, received a Team LiveStrong Jersey like the one you see Lance sporting here. While in Philly, Ben cornered me in the hotel elevator, and got me to sign his Team LiveStrong jersey, after he explained he’d be raffling it to benefit the LAF. It is because of his career as a bicycle patrol officer that this prize takes on an interesting twist. No, you’re not getting a “get out of jail free” card too. You see, as a police officer that rides bikes a lot, you develop many strong friendships along the way. Police officers in particular really like to help each other out, and as we all know, friends have connections. 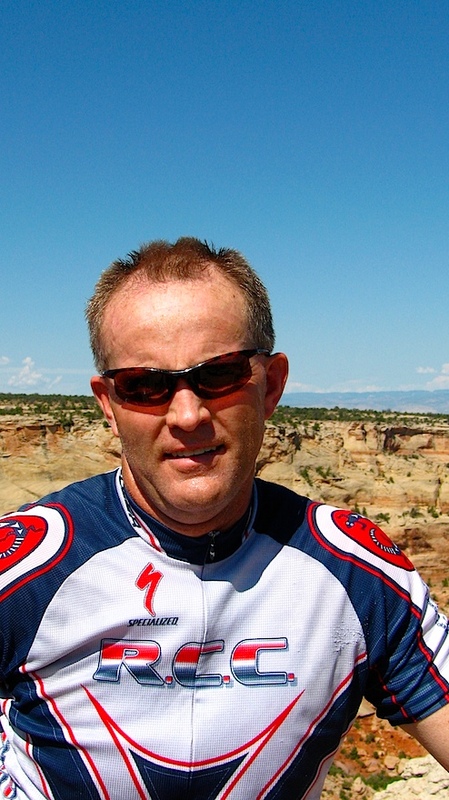 One of Ben’s good friends is also a bicycle patrol officer and because of that he has developed a working relationship of sorts with — you guessed it, Lance Armstrong. After Ben begged and begged, this friend agreed to bring the jersey to Lance and Lance graciously agreed to sign the jersey as well. Or at least, we can assume he was gracious, since Lance has not tweeted about being held hostage for an autograph. Here is where you come in. 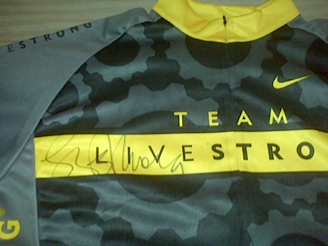 You can now be the proud owner of a 2009 Team LiveStrong jersey signed by me and Lance Armstrong. At the same time 100% of your $5 raffle ticket is going to the Lance Armstrong Foundation. For every $5 donation you get one virtual raffle ticket. $10 gets you two tickets, and so on. Donate here (http://philly09.livestrong.org/benkaufman) for your virtual raffle ticket. Sorry, no picture of my signature (it really is there). You’ll just have to believe it’s there. And also, you’ll have to believe how weird I feel about signing stuff. Just one problem: if you win you have to decide (if you frame it) do you want to look at Lance’s or Fatty’s signature (Lance signed the front, I signed the back). I’m sure you’ll do the right thing. The raffle runs until Monday, September 28, 2009 at 9:00 p.m. EDT. Click here to donate, and good luck! PS: Posts will be kind of scarce for the next few days. I have other fish in need of frying. I’ll be back in force next week. 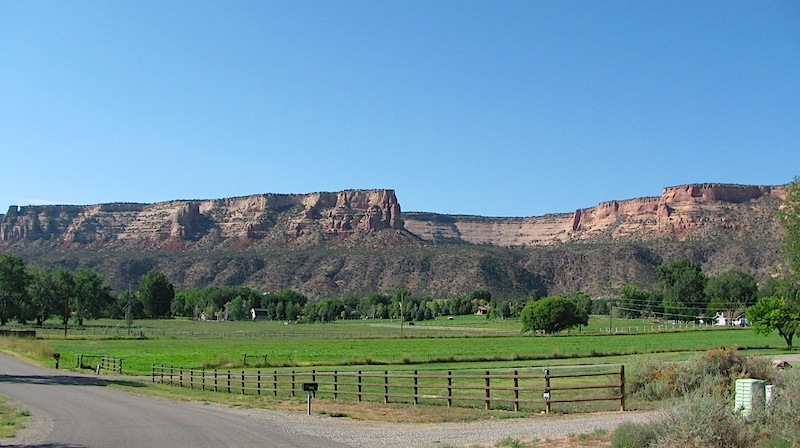 I grew up in Grand Junction, Colorado, and went to junior high and high school in Fruita, Colorado. And — get this — I didn’t even own a bike. Certainly, it’ s understandable that I didn’t own a mountain bike. If I had, then Klunkerz would have been about me. But, thanks to last weekend, I think I will always be angry at my younger self for not having owned a road bike. Because last Saturday — 30 years after my family moved to Grand Junction — I finally took the time to ride the Colorado National Monument. And it is about as tasty a road ride as there could ever be. What Is the Colorado National Monument? 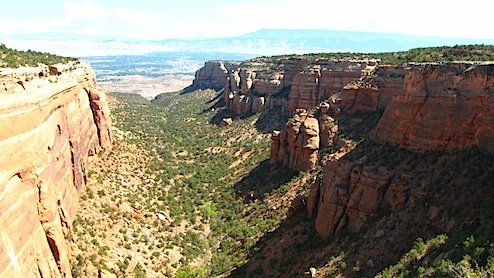 Yes, that dramatic sandstone backdrop is the Colorado National Monument. 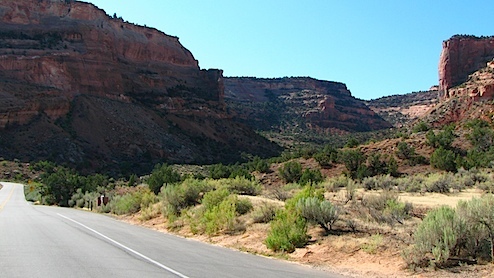 And there is a nice paved road that goes up one end — in Fruita — and comes down the other end — in Grand Junction — traversing along the top and giving you stunning views all along the way. 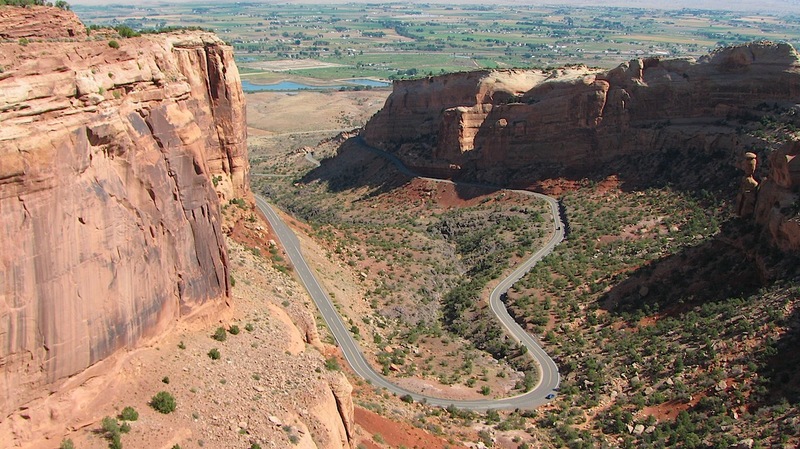 Riding the whole thing is a 35-or-so-mile-loop. And yeah, seriously, I’ve never ridden it before. I just kicked myself again, for good measure. 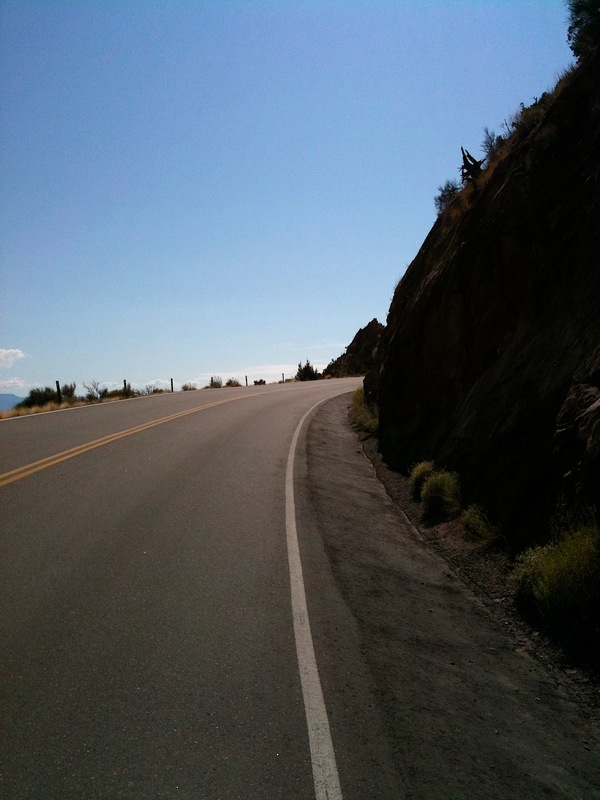 It’s steep, but nowhere near as killer (either in grade or total altitude gained) as climbing the Alpine Loop. It sure looks different, though. You see how perfect that pavement looks? Smooth. Unblemished. Almost creamy, really. Well, that’s how it felt, too. Really, some of the nicest-feeling pavement I’ve ever been on. And on a road bike, that’s such a pleasure. So about the time I got into my climbing groove, Rocky’s bike started ghost-shifting and having conniptions. In a few moments, the chain shifted all the way off the cassette, jamming between the cassette and the spokes. I went back and noticed that Rocky’s derailleur problems were the least of his worries. He had a couple places on his rear tire that were completely worn-through; tube was bulging out. 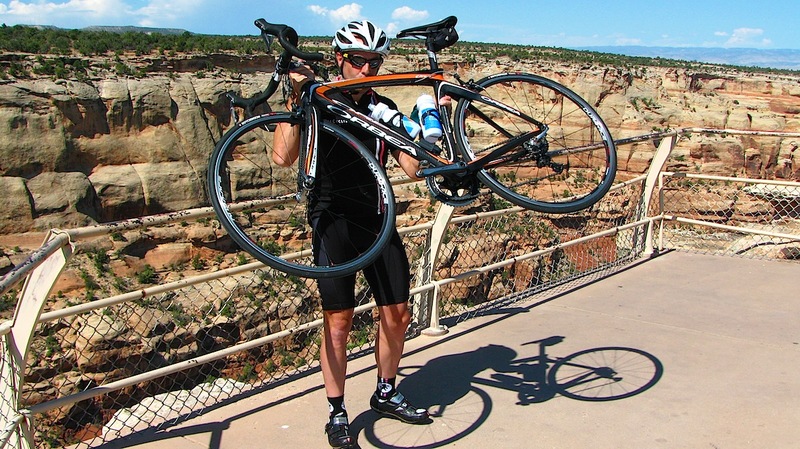 I told Rocky I didn’t want to ride down the Monument with someone whose rear tire could — and probably would — go at any moment. Rocky agreed that it wasn’t really that great of a day to die, and turned around. So now I didn’t have anyone I needed to impress with my climbing prowess. Which meant I could do this ride in full-on tourist mode. I began stopping whenever I saw something cool, pulling out the camera, and taking a shot. This happened pretty darned often. The climb lasts three or four miles. I stopped often and wasn’t pushing hard anyway, so it felt like an easy climb. I expect that perception would have changed if I had really attacked the climb. But you know, it was about 70 degrees and the scenery was beautiful and I was in no rush. So I just spun up, nice and easy. Loving the fact that I can call a climb like this “easy” right now. ‘Course, it’s still not a trivial climb. 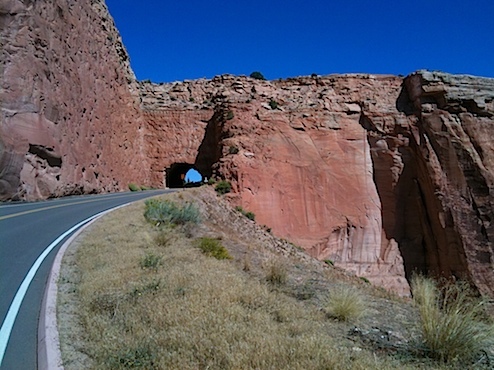 Once you’ve done the big initial climb, the road on the Monument rolls a bit, but nothing severe — I remember it as feeling pretty much flat, leaving me free to look up and see stuff. Riding, I thought to myself that I spend too much time on my bike focusing on my bike and how I’m riding it, instead of looking around and seeing where I am at the moment. 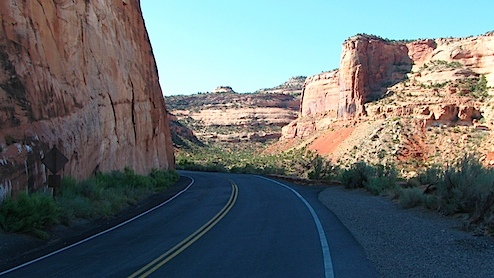 When I consider that the bike — mountain or road — gives you the ability to see things slowly enough to notice them, and fast enough that you don’t just see one thing the whole day, I realize that I am sometimes a fool. I’ve got the fitness to carry me to see incredible stuff. I need to take the time to notice it. Oh, and to take pictures of myself, too. I like this photo because it clearly demonstrates my head is larger than a major geologic formation (Independence Monument). That’s what happens when you’re a beloved cycling blogger celebrity type. I also like the way my glasses reveal how I took the shot. In my right lens you can see my shadow — me holding the camera up at full arm’s length. In my left lens you can see the reflection of my arm holding up that camera. And with all that work, I still didn’t smile. What’s my problem, anyway? I figured that I was on my own for the duration, but Rocky is cleverer than that. He dashed home, swapped wheels, and rode up the Monument in the opposite direction. He met me at Cold Shivers Point, an overlook with a several hundred-foot drop. I made sure to get a picture of Rocky. He always has such awesome helmet hair. Actually, the helmet ridges in his hair used to be a lot more prominent than they are nowadays. I wonder what’s changed? You’ll just have to trust that I’m telling the truth when I say that I’m kissing the top tube, not licking it. I’m not saying that I don’t lick the top tube, just that I don’t do it in public. 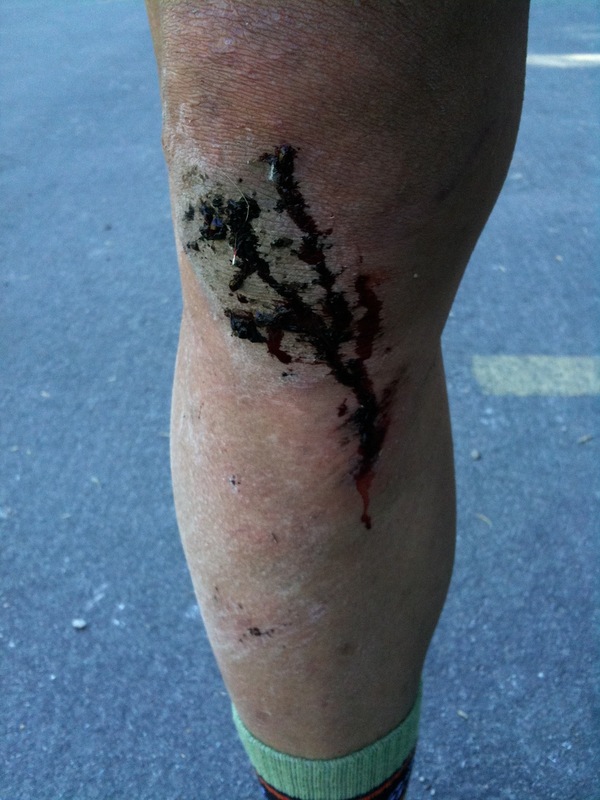 A few days ago I asserted that anyone who isn’t a mountain biker should be envious of those of us who are. Today, I’d like to say that anyone who doesn’t love road riding needs to get their head checked. The fact is, bikes are just really cool. I highly recommend them. And I still can’t believe that I waited until now to do this ride.